OWU is committed to helping students reach their academic goals by empowering them with the skills needed to be independent and competent learners. 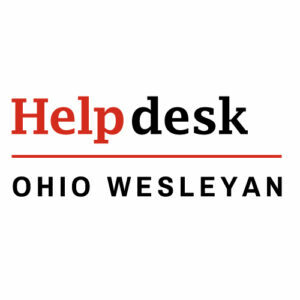 The OWU Disabilities Service Center delivers services for students. OWU Information Services works with students and the DSC to support the technology involved. Mac OS Accessibility and Windows Ease of Access Center have preferences and settings that can make computers more comfortable and easier to use for individuals with problems hearing, seeing, or controlling a computer. There are also numerous applications and devices designed to assist people of all abilities. Accessibility comes with a variety of assistive technologies to help those with vision disabilities, including a built-in screen reader, screen and cursor magnification, high-contrast settings, and more. Turn on VoiceOver to hear descriptions of items on your computer screen and to use the keyboard to control your computer. Switch the screen to black on white or white on black and make other contrast enhancements. Zoom in on the image on screen to make it appear larger. Make the screen flash, instead of making a sound, when an alert occurs. Use the keyboard to control the mouse and perform mouse functions. Turn on Sticky Keys or Slow Keys to help you press multiple keys and display pressed keys on the screen. These features work with your computer’s keyboard and with Keyboard Viewer. Enlarge the pointer to make it easier to see. In addition, you’ll find settings in the Displays, Sound, Keyboard, Trackpad, Mouse, and Speech panes of System Preferences that may make it easier to use your computer. The Ease of Access Center is a central location that you can use to set up the accessibility settings and programs available in Windows. In the Ease of Access Center, you’ll find quick access for setting up the accessibility settings and programs included in Windows. You’ll also find a link to a questionnaire that Windows can use to help suggest settings that you might find useful. Open Ease of Access Center by clicking the Start button , clicking Control Panel, clicking Ease of Access, and then clicking Ease of Access Center. Use the computer without a display. Make the computer easier to see. Use the computer without a mouse or keyboard. Make the mouse easier to use. Make the keyboard easier to use. Use text and visual alternatives for sounds. Make it easier to focus on reading and typing tasks. Magnifier – magnifies a portion of your computer screen, making it easier to read. Narrator – reads the text on your screen aloud. On-Screen Keyboard – lets you use your mouse or other device to interact with a keyboard on the screen.